Beautiful quilts...I love your Candy Shoppe quilt as well!! It is so happy!! And since purple is my favorite color, I so enjoy your purple quilt. Looks great on your floor with the kids dancing on it!! 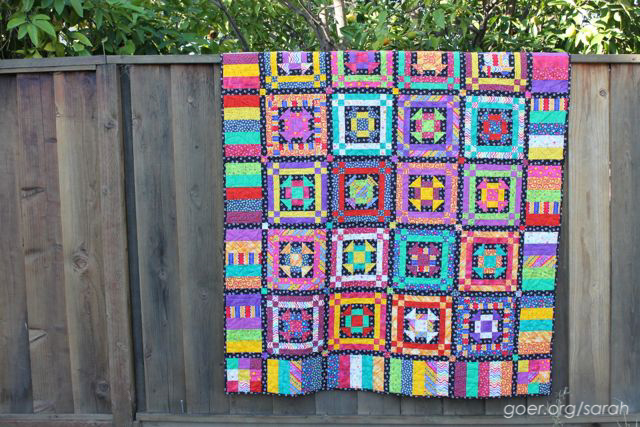 The Scrap Attack quilt is so colorful!! Love that one too!! Always look forward to see what you will come up with next!! Again, congrats on your 1st blogiversary!! Hi I'm stopping by in the blog party, such beautiful quilts, the purples ones gorgeous. I just found your Blog a few weeks ago and immediately subscribed to it. I really love it!! Of the quilts you've shown in this blog, I really love the purple one, as it is my favorite color too. But I do love the cute paper-pieced envelopes too. Congrats on the anniversary too! Thank you so much, Michelle. I'm so glad that you're enjoying the blog. Thanks for following! Sarah, this is spectacular. Great use of color. It would look so amazing hanging in my sewing room!! Happy blogiversary!! Hello! I am a helper from Vickie's Grow Your Blog. Just wanted you to know that a helper came by and peeked at your blog! So glad you wanted to be part of this fun Blog Hop! Thanks for posting and enjoy the hop! I love finding this blog as I am a novice quilter and it is so inspirational to see your lovely quilts! Thanks for posting the Mini quilt giveaway! Thanks, Rhonda. I appreciate your time to help Vicki with her event. I love this mini quilt! Thanks for the opportunity! Oooooo those Tula pink fabrics in the envelopes are lovely. The purple dance mat is also super-fun. Happy one year bloggiversary! I love paper piecing! I think that pattern is FAB! Really enjoyed seeing this adorable quilt at the Santa Clara Valley Quilt Association monthly meeting this morning. Thanks for sharing. Enjoying your blog, too. As soon as I can I am going to use your enthusiasm to motivate me to work on my WIPs, too!! Congrats on your blogiversary. 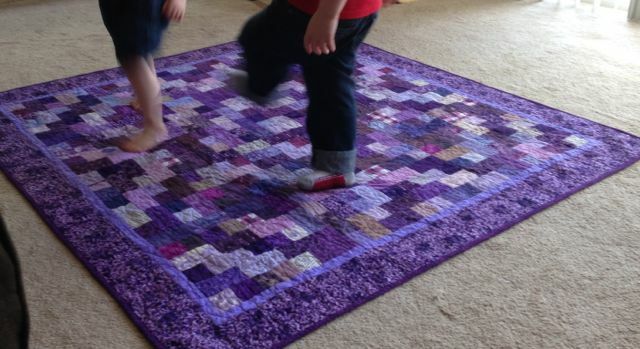 I love the photo of your children dancing on the purple quilt - priceless! I love your bright cheery colors and that you don't mind feet on your quilt! What a cheerful quiltmaker you are!! 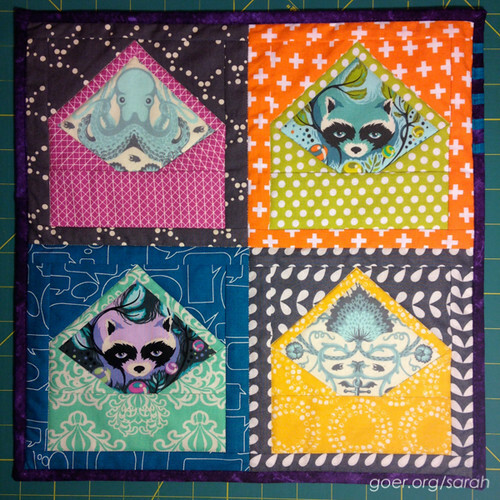 I love that little envelope quilt, and the giveaway quilt is just stunning! :) I signed up to follow you with bloglovin. Very pretty quilts, glad to see the kids like your quilt too. The candy shoppe quilt is very pretty. I have a few quilts that took me a few years too. Congratulations on your blogiversary and thanks for a great giveaway! I'm a textile artist visiting via GYB from St. John's, NL Canada. Lovely work. Thanks for sharing. I'm having a giveaway on my blog. Please drop by. I love colour too (which is why I like crazy quilting so much). Your purple quilt is wonderful because it's one of my favourite colours. If I happened to be lucky enough to win your giveaway there would be no possible way it would ever be used near food or drink because I'm a notorious slop!! Thank you for having us over to visit with you. I commented on your lovely planets, thinking I was on the post with the envelopes! Again, I think the envelopes are a great way to showcase fabric that gets a little creepy when you have a lot of it staring you down in the night. Thanks, Jennifer. Now I just keep seeing more and more things that I just want a 5" square of to feature in an envelope block. I love the mini quilt! Hi Sarah, I just had my first blogiversary too! Your quilts are lovely, and that purple quilt is wonderful on your header. Visiting from GYB, it is taking a while to get around to all the wondeful blogs. Thanks for being a part of this hop. Happy Blogiversary! I was very impressed with your stellar wind quilt. I just love your blog and adore your children. I think passing on your passion to your children is so gratifying. Keep up with the good work and can't wait to see the children's' finished quilts. Wow, you are so generous to offer a little quilt! Thank you! I love your work! It has been a pleasure to follow your blog this past year. I'm not a quilter but I appreciate the design work, the beautiful fabrics and your eye for blending color. Congratulations on year #1, and here's to many more. Love your work! Glad to have found your blog through the GYB event! Your Candy Shoppe rocks!! Thanks, Jennifer. That is one that I'll be showing at my guild quilt show next month. It was a long time coming, but I'm really enjoying that one being done. Thanks for visiting! Nice quilt work! 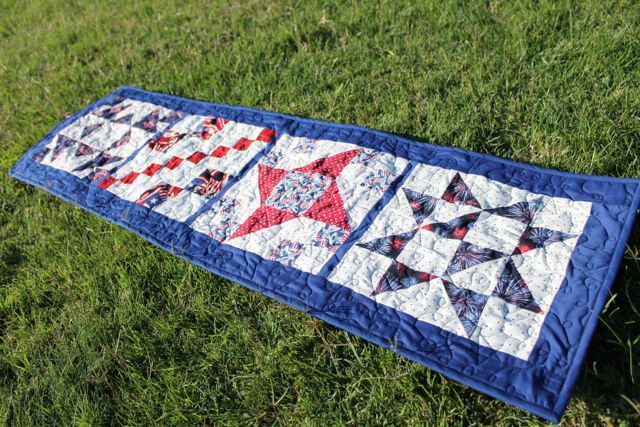 We love all the items make...adding the mini quilt would make our collection even better! I love that you're doing a giveaway! I love that you're teaching your son to quilt! My sincere apologies for encouraging the giggle king, yesterday!!! I just love looking at what you create. A winner winner chicken dinner mini quilt would look awesome on my gallery wall.